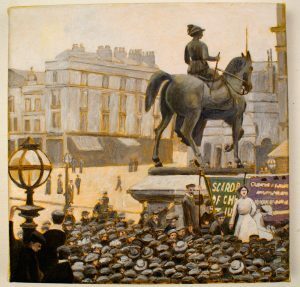 In the course of my study of the war I began looking at the organized political activism in England of the time and discovered the efforts of E.D. Morel and Roger Casement fighting against the genocide of the people of the Congo at the hands of King Leopold of Belgium. In 1903 Morel started his own publication, The West African Mail to report the true facts and figures of the genocide in Africa. 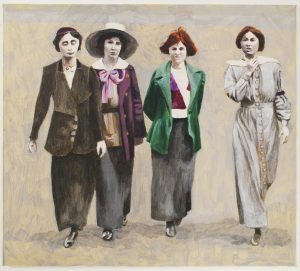 Concurrent to this, in1903 the militant Women’s Social and Political Union was founded by the Pankhurst family. Its motto was “Deeds not Words”. 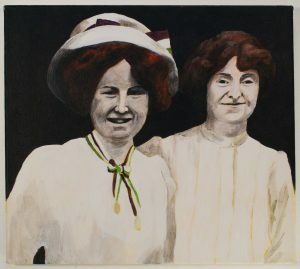 In 1906 the Daily Mail newspaper gave them the name Suffragettes. 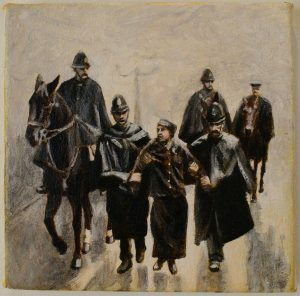 Over a period of 11 years up until the outbreak of WW1 thousands of women members went to prison. The majority was sent to jail for minor charges and a small percent for more violent action. 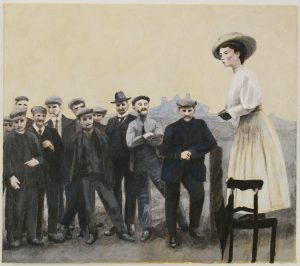 There were many other women rights organizations in England that had existed prior to and along with the Suffragettes but none were as radical in their methods. 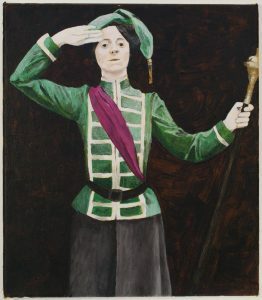 It was researching this organization and looking closely at related photographs that led to my next series of paintings. 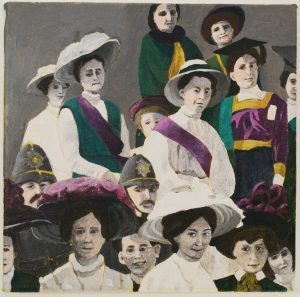 The Suffragettes represent an homage to and reflection of the public demonstration and ‘mediatization’ of civic dissent in the Modern age and the development of social discourse about inequality within and across social communities. 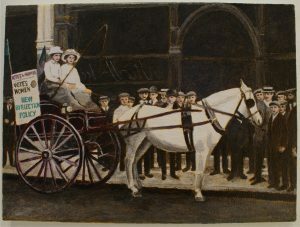 As with the paintings from the after 1914 series, The Suffragettes are based on historical photographs, in this instance taken from the archive at the Museum of London. I reframed the compositions on canvas selectively, leaving out the many, myriad details recorded by the camera so to focus on the individuals at the center of action. 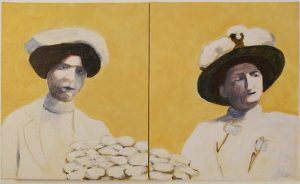 Additionally, I have added colour to the original black and white recordings, and sought dramatic points of intersection between subjects and the spaces within which they are found. In particular, I’m interested in the faces caught in the photographs: faces that express enthusiasm, collective resolve and, most of all, shared passion for an idea. 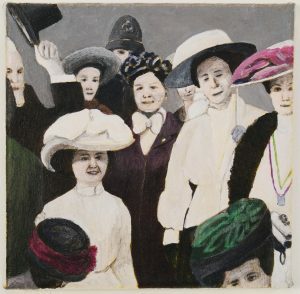 In crowd scenes I look at the faces of the audience and find a range of expressions, from focused attention to curiosity to bemusement. I look for faces showing self-consciousness for the camera in the form of shyness to mild posturing, and I look for sadness and anger. Nostalgia and romanticism are by-passed as are attempts at making masterful paintings. 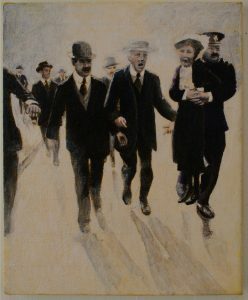 This series of paintings is not a comprehensive survey of the Suffragette movement but rather a partial study of the emotional complexity of bearing witness to historical events.